Well there we all were sat there in the Station Hotel in Castleford in the county of West Yorkshire, and it was the Wednesday quiz night in the summer of 1991 as I tend to remember. There were six of us sat round that table: myself (Simon Curtis - the Official), the Archbishop himself Harry Sledmore, Harry "can't read me own writing" Beevers the cleverest blind chap you'll ever meet, the Dude of course, David Woodward, colloquially known as Diddy, and my best mate Shaun Flanagan. We were in a mood for foundling behaviour. It was the Wednesday quiz night, set by that master of disaster, the Gadge-Dude himself aka Steven Scott esq, and not content with having handed out a further thrashing to those who became the Junction team, our smalltown minds turned towards the fact there was now no quiz league in the district, what with the John Smith's League just having gone defunct. I'm sure it was Harry Beevers who did most of the bemoaning the now lack of a quiz league due to J Smith's QL going bonkety-bonk, and so an idea came into my head. I remember it well...I piped up "Well I'll tell you what Harry, I'll tell you what then...we'll start one, we'll start a new quiz league for the Pontefract and Castleford area, me and you Harry. I'll sort it all out and you can do the questions. How about that!" Well I could tell he was septical, but he sort of nodded his head in vague agreement and so me, being the addictive personality I am, and as Shaun used to put it, getting another harebrained scheme in my head and taking it to the nth point of conclusion, I did it again. 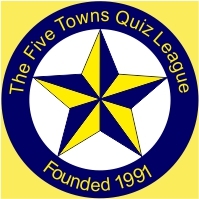 I went out, I found nineteen teams, put an inaugural meeting together, held at the Parkside Inne in Pontefract, they all attended and then Harry had to believe it, the Five Towns Quiz League was born and he'd blinking well better get started on some questions! Fast forward to more than a quarter of hundred later and here we are, at the beginning of our twenty-eighth season of the FTQL. Amazing when you think about it. But in the end all it takes is a bit of passion, a bit of enthusiasm, and even my most sternest critics would have to admit that I when I get an idea in my head that I've got those qualities in abundance. We did it. We did it and got it started all those years ago, and to quote the Limehouse Golem, here we are again, let's go quizzers...the Five Towns Quiz League...founded 1991 and still bloody going! Proud or what!